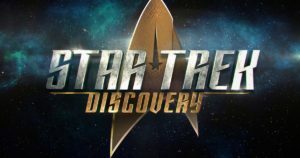 It’s been roughly 12 years since the last Star Trek show aired on television and fans have been clamoring for a new one. With the success of the recent film trilogy that introduced a new generation of what it meant “to boldly go where no man has gone before,” the timing couldn’t be more perfect. 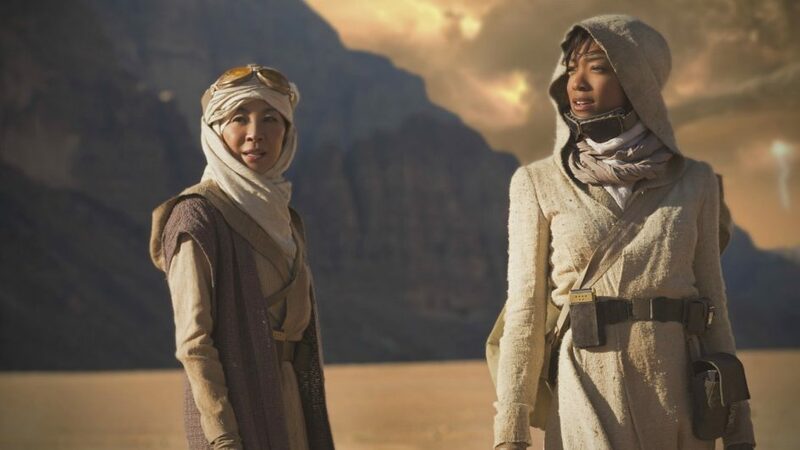 Star Trek: Discovery takes place 10 years before the events of the original Star Trek series. Spock’s dad will even be part of the crew. While not much is known about the story or direction, the trailer and the cast look impressive. I was especially happy to see Michelle Yeoh from Crouching Tiger, Hidden Dragon as part of the supporting cast. Also, Doug Jones, who played Abe Sapien in the Hellboy movies; James Frain, who played Franklin Mott in True Blood and Jason Isaacs, who played Lucius Malfoy in the Harry Potter films. We’ll have to tune in to CBS in late September to discover if the story is as strong as the cast. Over on FOX, they have their own Star Trek show slated for this fall. I didn’t realize this until last month, when I was re-watching Galaxy Quest with a group of friends. I was commenting on Tim Allen’s most recent show, Last Man Standing, being cancelled on ABC, in spite of high ratings. One of our friends took out his phone and showed us a trailer for The Orville. While not the Galaxy Quest TV show we were hoping for, the trailer did look funny. 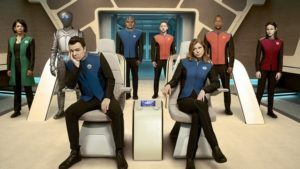 The Orville is a parody live-action series starring and created by the very talented Seth MacFarlane, who also created Family Guy and American Dad for the network. Set some 400 years into the future, Seth MacFarlane plays the captain of the space exploration ship The U.S.S. Orville. “You’re nobody’s first choice for this job,” his superior reminds him, when assigning the captaincy. 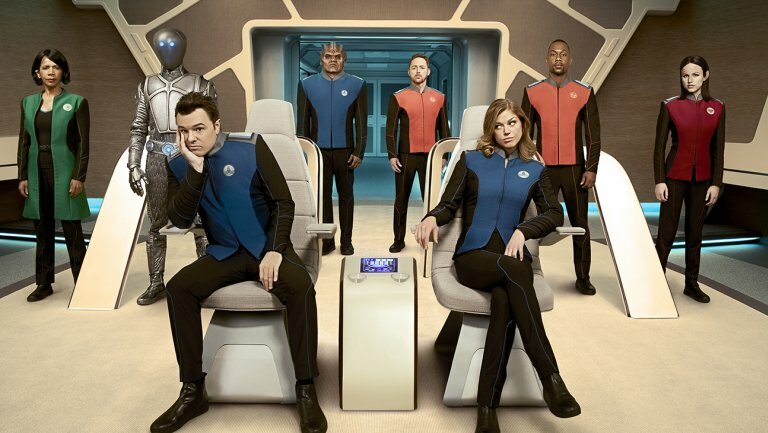 Joined by a mishmash crew made up of humans and aliens — including the captain’s ex-wife as his first officer and a gelatinous blob voiced by comedian Norm MacDonald — MacFarlane, who voices the title character on Family Guy, will also be joined by the voice of American Dad, Scott Grimes, who plays the ship’s helmsman. It sounds like this crew will embark on some hilarious hi-jinks as it explores strange new worlds. Television isn’t the only medium that will be mirroring Star Trek. During my interview with comic book artist and writer Devon Massey, I asked him about his next two upcoming issues titled Cavewoman: Starship Blish. The title heroine encounters a time-traveling crew from the U.S.S. Blish that very closely resembles Kirk, Spock and the rest of the original Star Trek crew. The name “Blish” is taken from James Blish, who worked on the novelization of the original series. I asked Devon which Star Trek series and captain he liked best. I also wondered if Carrie Fulton (Cavewoman’s best friend) would get a Star Trek-like phaser. During the second half of 2017, there seems to be a bevy of entertainment focusing on crews discovering the final frontier. For those viewers who can’t wait to seek out new life and new civilizations, they can always hit the theaters to see Valerian and the City of a Thousand Planets. Otherwise, stay close to your televisions this fall. Whether you’ve waited for a Star Trek show to return or want to watch a parody, you’re bound to have a smile on your face when you tune in.